A range of hills to the west of where I live, the Sliabh Blooms are the eroded remains of a mountain range formed about 400 million years ago. This makes them one of the oldest mountain ranges in Europe. Before the Great Famine (1845-52) this was a very populated area. The population never recovered after this calamity. Now its a favourite place for hill walkers who like a little bit of solitude. In this painting experiment I placed an under layer of Alkyd colour which was lightened in tone by the addition of Titanium White. This was, in a way, similar to the Watercolour technique of laying down light coloured washes to be over painted in the darker transparent colours of the later stages. From the beginning it was not going to work. Alkyd colours from the tube are more transparent and vivid than traditional oils. With the addition of white this transparency is completely lost and the resultant colour mix has a ‘milky’ look. Furthermore, the chroma of the original is also lost. If either transparency or chroma survived the mix with white, this might have worked. Without either, it doesn’t. When the solvent evaporated the colours were set enough to overpaint in standard oils, and this allowed me to proceed with the painting. The quick dried Alkyd did help as I was able to place a very thin layer of oils not completely covering the Alkyd. This was important as I was planning to overpaint some very thin lines of trees, silhouetted against the bright light in the distance. This I was able to do without having to scrape a series of fine lines in the light coloured paint and painting into them which I would usually have to do with standard oils. This is of course if the painting is to be completed in a single session. I’ll post the video of the process in a few days. See you then. 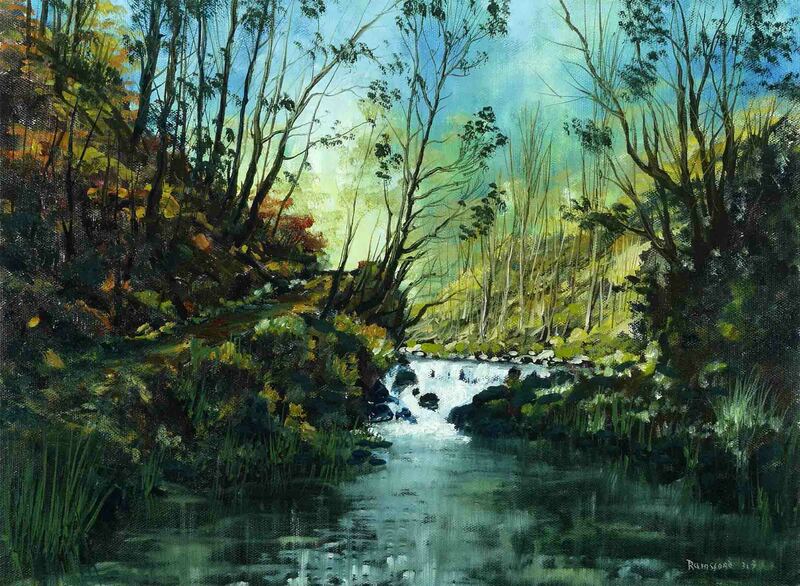 This entry was posted in Oil Painting and tagged Alkyd, Art, Culture, Education, green, Hills, Inspiration, Irish landscape, lake, Mountains, Oil Painting, Oil Painting Instruction, Oil Painting Landscape, painting, Pictures, Sky, Trees, Water, Waterfall. Bookmark the permalink. I know you’re saying the underlying Alkyd oils didn’t work, but I think this is one of my favorite paintings you’ve completed recently. I can tell from your work that Ireland is very broody, but this one has a warm hopeful feeling. I like it a lot! How do you store your completed paintings? I’m a novice painter and have already found that I have no idea what do with the ones I’ve completed. Do you sell your originals? Do you display them in a gallery? Do you find that an online presence is critical to artists now? Thanks Jason. This is an ‘old’ country, bypassed by progress in many places. I’m inspired by solitude, peace and a sense of history in the places I visit. I do understand what you mean by the ‘broody’ look but its not my intension. I paint on ‘loose’ canvas. This makes storage a lot easier. I have a rack with multiple shelves and as a painting is ‘oiled out’ I place it on the next shelf until I get to the bottom, then I start again. This is not ideal but it stops the stacks of paintings on each shelf from getting too heavy. Oil pantings darken when not exposed to light so I take the older ones out from time to time when the sun shines (which is not very often here). I have absolutely no interest in selling paintings. I love to exhibit the work but hate the commercial side of galleries and all that. I think being an artist and being a salesman are not compatible. One destroys the other. That is why the internet is so important. An artist can develop and engage with an audience without the compromises of commerce. I love your work and the generous explanations. You are right about the business of art, but that, too, can be a creative effort. I really, truly love this one! You’ve created a different sort of sense of depth in this one. And for some reason the blues in the sky are different, more vibrant. Regardless, whatever you have done, this one is beautiful. And you made me chuckle about the business, commerce side of things. I’ve been finding I am much more comfortable “promoting” the works of others as opposed to my own. If someone wants to talk about technique etc, I am great, but when we get into the whole sales pitch/story/hook thing, that is when the turtle wants to crawl back into her shell.